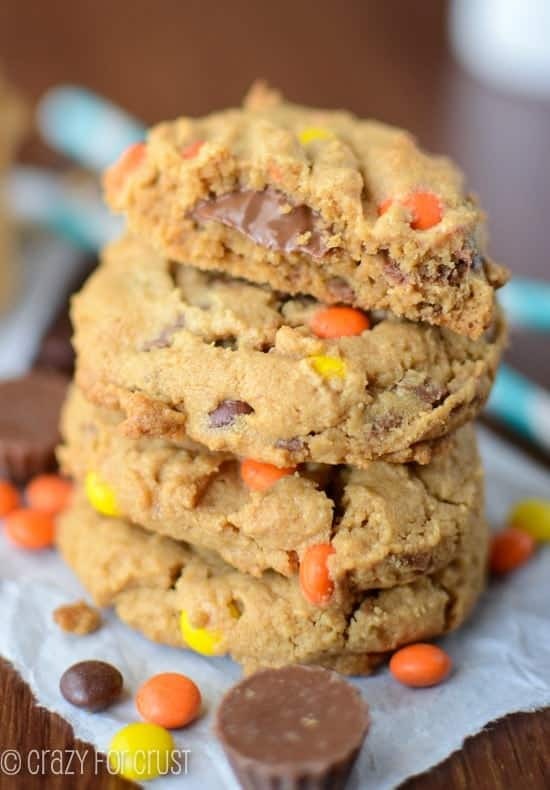 Reese’s Pieces Cookies are a basic chocolate chip cookie filled with Reese’s Pieces instead of chocolate chips! This is my favorite chocolate chip cookie recipe made even better with the peanut butter crunch of the candy. Why use chocolate chips when you can use Reese’s? 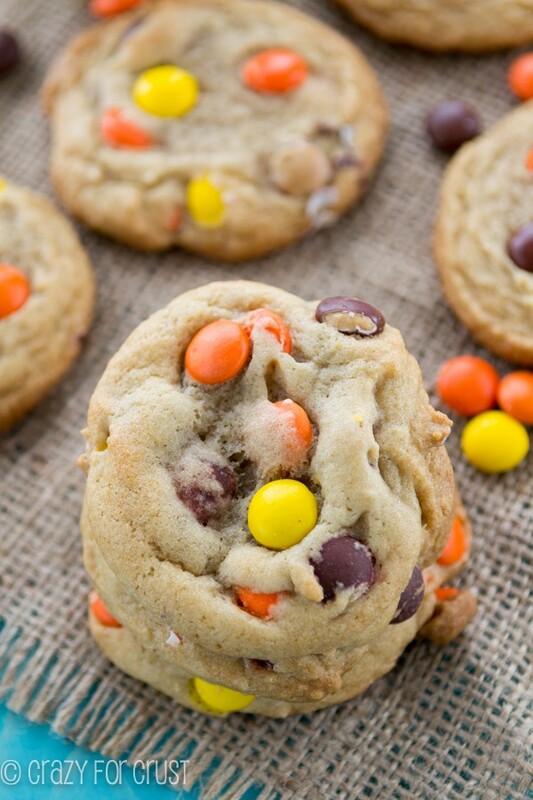 Reese’s Pieces Cookies – satisfy a craving? Do you ever just get a total craving for something? Like, say, brownies? Or cake? Or maybe banana muffins? Or COOKIES? Unfortunately, I get these cravings all the time. Even though I’m constantly surrounded by a plethora of dessert, I still get cravings that need satisfying NOW. When that happens, I know I should listen because if I don’t I’ll end up eating 14 pounds of other dessert to compensate, which won’t satisfy the craving, so I’ll just end up making what I want anyway and eat it. 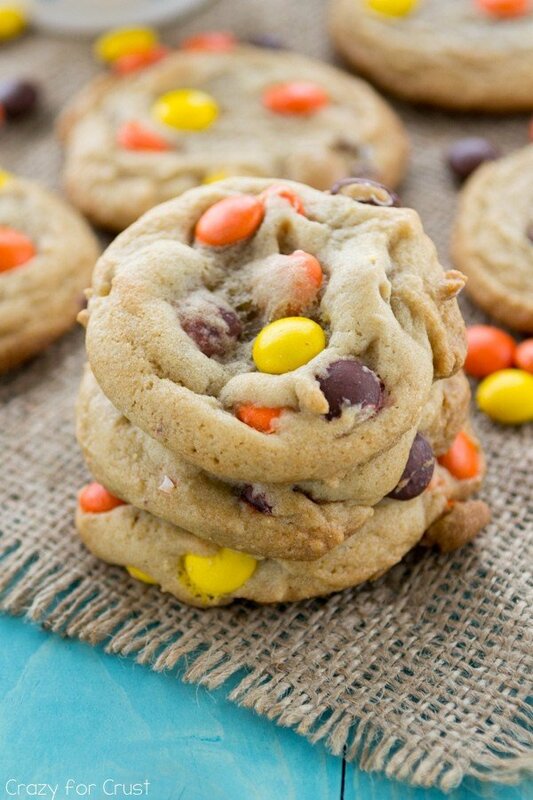 Reese’s Pieces Cookies. That satisfied BOTH cravings! This easy cookie recipe is full of Reese’s Pieces! So many times when you find a Reese’s Pieces cookie it’s a peanut butter cookie, which is great, but sometimes you don’t want a peanut butter cookie. Sometimes you want the distinct flavor of a chocolate chip cookie, but with a hint of peanut butter. When you look at Reese’s Pieces cookies on Allrecipes or Pillsbury, all you find are peanut butter cookies. In that case, come here, because these Reese’s cookies are just a plain old chocolate chip cookie without the chocolate chips! And when I say “plain old” I mean fantastic. This recipe is my favorite cookie recipe! Softness: a cookie shouldn’t be crunchy. I chill my cookie dough to make sure it’s super soft, and I use melted butter to help with that too. Depth of flavor: I use melted butter and tons of brown sugar to make sure my cookie has a huge amount of flavor. Mix ins: use whatever you like! Chocolate chips are perfect for a basic cookie, but adding Reese’s Pieces make these cookies heaven. I love how the Reese’s give this cookie a hint of peanut butter flavor without being overpowering. I love me some peanut butter but sometimes I just want a bit of it, you know? Making Reese’s Pieces Cookies without peanut butter allows the candy to shine! 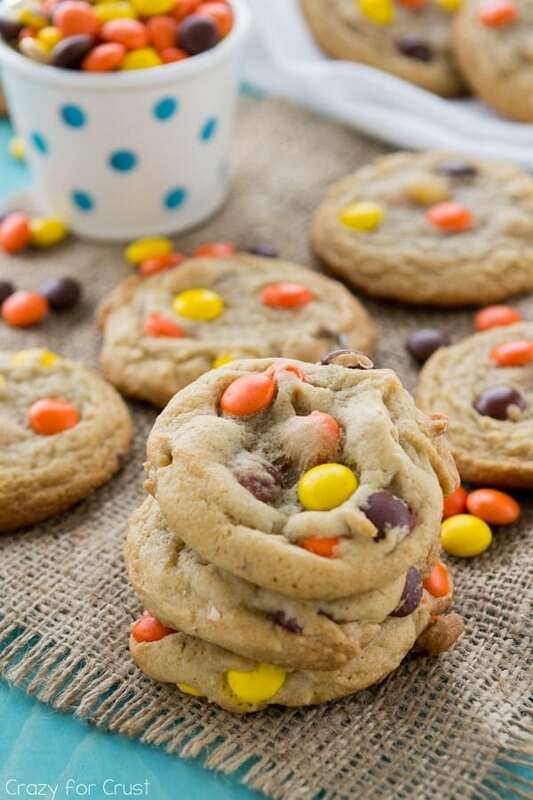 Reese's Pieces Cookies are a basic chocolate chip cookie filled with Reese's Pieces instead of chocolate chips! This is my favorite chocolate chip cookie recipe made even better with the peanut butter crunch of the candy. Mix in baking soda and salt, then slowly mix in flour and mix just until the batter is smooth and comes together. Be sure to scrape the sides of the bowl during mixing. Slowly mix in Reese's Pieces. Be sure to check out all my peanut butter cookie recipes if you’re craving peanut butter! Want other ways to use Reese’s? 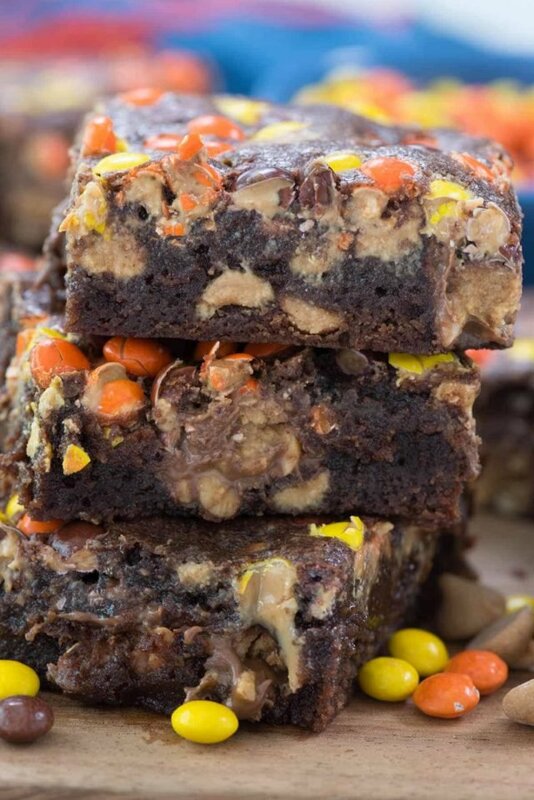 Try Loaded Reese’s Peanut Butter Cup Bark, Reese’s Pieces Blondies, or Reese’s Peanut Butter Fluff. Reese’s Explosion Peanut Butter Cookies will surely satisfy your peanut butter craving! Want a chocolate chip cookie AND Reese’s? 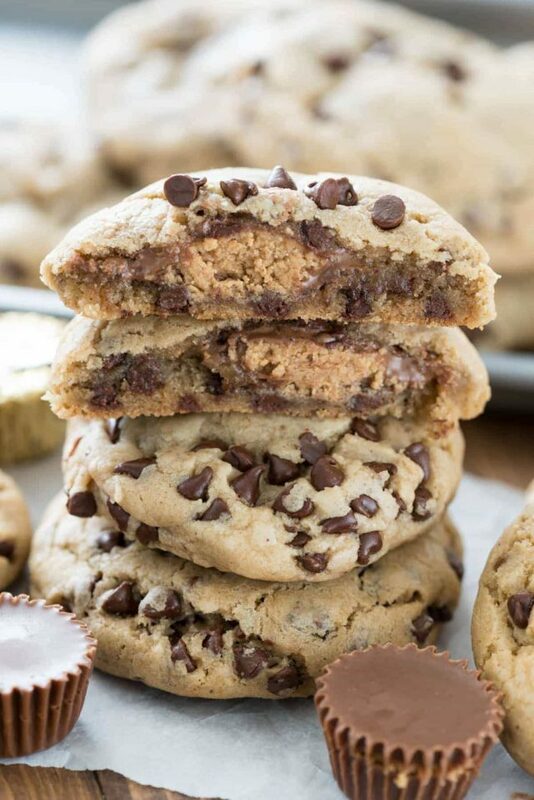 Make Reese’s Stuffed Chocolate Chip Cookies! Another way to use Reese’s Pieces? In Reese’s Overload Brownies! Ahhh cookies, I crave them constantly. These look YUMMY! I get cravings WAY too frequently. These cookies look amazing! The number of times I have cravings for something baked or sweet… Well, there’s a reason baking bloggers need to work out every day. 😉 (Now why can’t we call that a business write-off??) LOVE how you swapped in Reese’s pieces!! CAN I freeze this cookie dough and cook it say a week later? I love the Reeses Pieces cookie link, my kids especially do. Unfortunately the link to it on Ebay doesn’t seem to be working any longer. Do you have another option to finding the recipe? I live for anything Reese’s pieces! Can’t wait to try them. Just made these this weekend. I failed to look at how many servings it made—I got 21 cookies out of it but that was only because of all the Reese’s pieces. Not great for a party unless you double the recipe. A cup and a half of Reese’s was waaaay too much in my opinion. I would cut back to a cup so you don’t get cookies that are mostly candy (but you’ll probably end up with fewer cookies). I like a more dough in a cookie. Not sure why my cookies didn’t really spread in the oven. I followed this recipe exactly and chilled the dough. They remained more mounded than cookie shaped. Not bad but just a couple things to consider. Sometimes if the dough is very cold they don’t spread as much. I don’t always have that issue but when I notice it I’ll push them down with the palm of my hand a bit. You can always add less candy, I just like more candy then less. Made the recipe to the tee. Dough was very dry and hard to work with. I think next time I will cut back the flour and/or add one more egg. They taste okay, but I am disappointed in how hard and dry the dough was. I was careful to chill at least 3 hours and wrapped it tight in plastic. During the mixing process, as I was adding the flour, I thought about throwing in an extra egg cuz I did not like the texture/consistency! Thank you for this recipe!